March 30, 2017, 1:11 p.m. 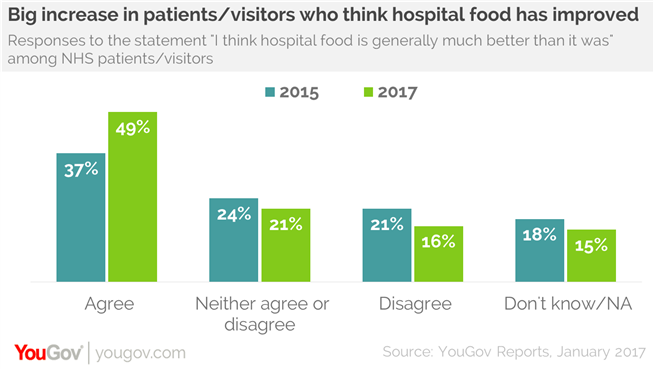 Patients and visitors believe hospital food is improving but issues around quality remain, a new YouGov study finds. The Hospital Catering report shows that people’s perception of hospital food has increased significantly in the past two years. In 2015, 37% of NHS patients and visitors thought hospital food was improving in quality but now this figure has increased to 49%. 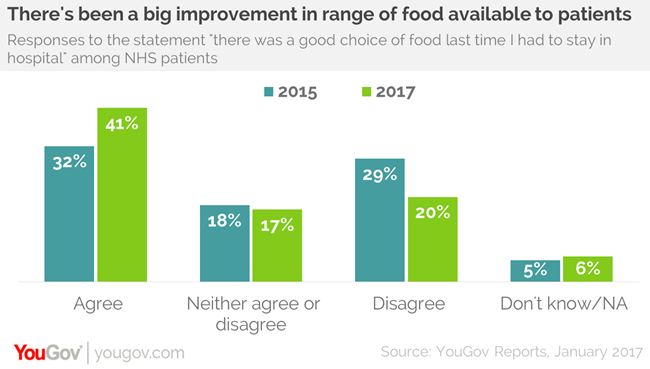 Furthermore, patients say there has been a notable improvement in the range of food available since YouGov last ran the study in 2015. Currently over four in ten (41%) believe there is a good choice of food in hospitals, up from around a third (33%) two years ago. The report finds that issues still remain when it comes to hospital catering, though. A third (32%) of NHS visitors and patients believe that the food given to those in hospital isn’t very tasty. Additionally, words hospital workers use to describe the food available are “unappetising” (38%), “stodgy” (25%) and “processed” (25%). Yet the study finds that people are willing to put their hand in their pocket to combat these shortcomings, with around three quarters (74%) of NHS hospital patients or visitors saying they would pay to improve food choice and standards. However, they wouldn’t be prepared to give much – with approaching two-thirds (64%) willing to pay less than £3.